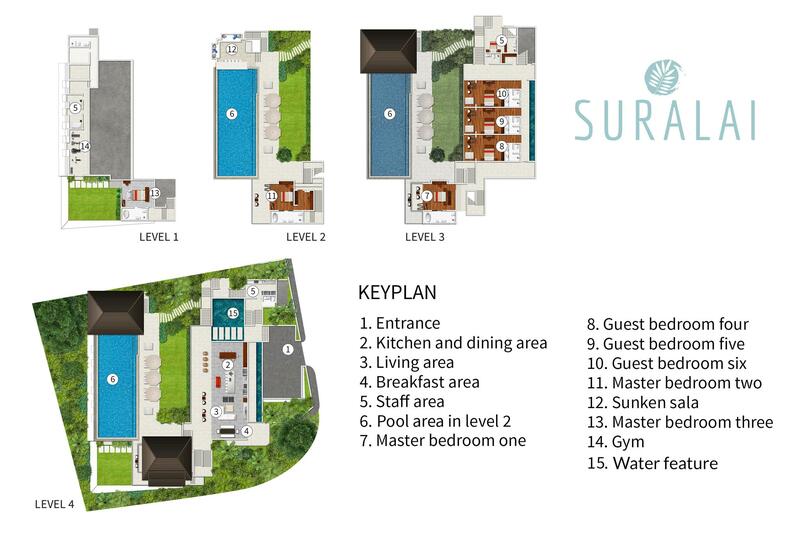 Designed over four main levels, you enter Suralai’s elegant gated entrance at the top level. Steps descend into the main living and dining pavilion. One level below are three identical double bedrooms and a walkway connecting to an adjoining pavilion with three master suites. Stairs descend on both sides of the villa onto an expansive pool terrace and 25-metre infinity pool. To one end of the pool, steps drop further down to a sala with daybeds surrounding a wooden dining table, a buffet and swim-up bar. A separate staircase provides access to a fully equipped gym. The living pavilion, with its expansive dining and entertainment space, forms the social hub of the villa. Enjoy breakfast on the cool, shaded terrace, with breath-taking views of the ocean and mountains, and gather for evening cocktails around the island bar. Dinner can be a formal affair at the villa’s magnificent dining table that seats 16 guests. A black-gloss and chrome Western-style show kitchen forms a striking backdrop for the bar counter which is set with high stools for socializing. An expansive Hollywood-style lounge area features a sumptuous white leather L-shaped sofa and easy chairs around a 75-inch flat-screen satellite smart TV. Wrap-around floor-to-ceiling glass doors connect to the wide terrace for seamless indoor and outdoor living, ideal for special events such as weddings. Suralai has been designed to maximise the spectacular views from every aspect. By day, the changing colour of the sea is mesmerising – this is how the locals tell the time – and evenings are lit by blazing, tangerine skies as the sun dips majestically over the horizon. The top-level terrace, which wraps around the living and dining pavilion, is furnished with an informal dining table for up to 10 guests and large, comfortable easy chairs, as well as traditional planters’ chairs. A wide, sand-washed terrace, furnished with comfortable loungers and sun shades, borders the 25-metre infinity pool. At one end, steps lead into a fan-cooled sunken sala with a vaulted ceiling and wide, cushioned day beds, which surround another dining table for up to 10 guests. A swim-up bar with sunken bar stools, make this the hub of outdoor life at the villa. A large lawn, with palms trees on either side, extends from the pool terrace and makes an ideal venue for parties and weddings. Six spacious, luxuriously furnished bedrooms include three master suites and three guest bedrooms. Each room is stylishly designed with warm wood floors and light grey textured surfaces. Elegant wooden furnishings, including four-poster beds in two of the master suites, are complemented by a cool colour palette with vivid Thai-silk accents. High quality bedding and 300 thread-count bed linen make for a comfortable night’s sleep. All rooms are air-conditioned and feature a sophisticated AV set up with a 30-inch flat-screen TV, DVD player, iPod dock and surround-sound system. The ensuite bathrooms in each master bedroom feature walk-in rain showers and an inviting oval freestanding bathtub with romantic sunset views. On the top level of a separate pavilion adjacent to the main building, this master suite features a stunning wood-lined vaulted ceiling, a king-size four-poster bed and a private balcony with seamless glass balustrade to showcase the magnificent view. A wall of wardrobes provides generous storage space and a personal safe. Double wooden doors slide open to reveal an expansive ensuite bathroom designed in cool grey ceramic tiles with warm wood finishes and a double terrazzo vanity. Located on the pool level, this stunning bedroom opens directly onto the pool terrace and garden, with panoramic ocean and mountain views from a king-size four-poster bed. In the dressing room is a large traditional Thai daybed (suitable for sleeping a child) and a wall of wardrobe space with a personal safe. Double wooden doors slide open to reveal a spacious ensuite bathroom with double vanity. Located on the lower garden level, this room features a king bed as well as a double day-bed, and opens onto a landscaped garden with ocean views. A wall of wardrobes provides ample storage space and a personal safe. The ensuite bathroom has a single vanity. Steps lead down from this room to the garden terrace and gym. These three rooms are identical. All are furnished with king-size beds and have stunning views, a wide wood-decked terrace and double daybeds for massages and lounging. Ensuite bathrooms tiled in cool grey are fitted with double vanities, walk-in rain showers, and have separate WCs. A wall of wardrobes provides generous storage space and a personal safe.